What is with the ginormous bags?!? They’re huge. You could, I expect, carry not only toiletries, phone, wallet, and car keys in one, but possibly a full wardrobe change, several firearms, and a positive menagerie of pets. Maybe that is it? It is like a new version of homeless chic. You may not be able to afford a place to live after purchasing that Coach bag, but you won’t really need a place to hang your hat… or pants… or anything because it all fits in the bag. Doesn’t matter if you look like a staggering hunchback due to the imbalanced weight dangling from one shoulder or the other… you are en vogue! I looked up the word “purse” in the dictionary. I ignored the part about the lips being drawn together to express displeasure or irritation (but I could see how discomfort might come into the issue with some of these bags). The definition that pertains in this instance is “a small bag used especially by a woman to carry everyday personal items.” Who needs that much stuff every day while out?!? Holy cowhide! Look at this gal. I’m fairly certain that if that bag actually contained anywhere near the material to fill it, it would outweigh her. I have referred to myself as an accessory moron, but if there is one area in which I am even more of an imbecile, it would be with regards to handbags, purses, clutches, evening bags… I am not only uninformed, I am totally uninterested. The most likely outcome of me carrying some sort of luggage would be that I totally forget to take it with me and leave it hanging on a chair, in a chair, on a table, under the table… you get the idea. I am not of the mindset to carry my belongings in a stylish receptacle. In fact, I’m likely not to carry a receptacle at all, stylish or not. The only exception is for situations like conferences or travel when I might have a carry-on or utility backpack that is capable of housing all the necessities, but more often to stow the various items and information gathered at booths and tables and vendors along the way. Even so, what do I really need to have with me? I honestly cannot imagine requiring on my person while walking freely about town enough stuff to require the space of a large attaché or small suitcase. 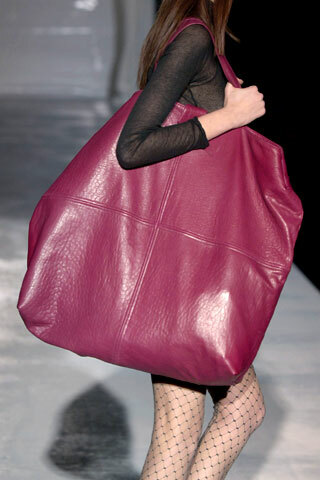 However, that is not so much the issue as the question of why do purses now resemble luggage? I mean, seriously, I remember a time when purses of the larger variety were restricted to individuals who carried the necessity of changing an infant or toddler (aka, the diaper bag) or to those individuals of an uncertain age (aka, grandma bag). You know what I’m talking about, because mother’s who are trying to travel or just run errands with accompanying offspring cannot do so without many parcels and items that the rest of us generally don’t require (snacks, drinks, activities, diapers, wet wipes, pack and play cribs, physical restraints…). As for grandma, I never did understand all that. There might be wallet or billfold, checkbook, glasses, tissues (in varying states of use…ew), a collection of candy, gum, and cough drops, hair brush, hair spray, compact (with or without make up)… houseplants and maybe a floor lamp… The words “Just a moment, I have it in my purse…” were generally guaranteed to foreshadow a 20-30 minute archeological dig through a voluminous shoulder bag. So, when did this become fashionable? I suppose technology can assume part of the blame as people seem more and more incapable of functioning without a laptop or tablet that might be larger than a pocket or clutch. Without the accompanying larger devices though, I’m baffled. I’ve seen young… young people squealing at non-human decibel and frequency over gargantuan constructions designed, I’m certain, to hold most of their worldly goods. What are they actually doing? If they pack the thing to its capacity, they are likely to cause significant and permanent spinal deformity that would draw pity from Quasimodo. You cannot convince me it is necessary for the individual who can actually afford the monstrosity to carry everything she owns, unless… maybe that is it. Due to the cost of fashion, the purchaser is no longer able to afford lodgings and is forced to convey their possessions and all necessities with them at all times? Has our world and society become such that all inhabitants should have a bug-out bag with them at all times? Maybe they actually live in there? Now that would be a trick. I might actually take up the habit of carrying some sort of baggage when they manage to harness some sort of mystical force or scientific breakthrough to create Timelord type technology that makes it bigger enough on the inside for me to crawl into it or possibly a bag of holding capable of also serving as my residence. At that point, we can talk. Until then (and without chiropractic services on retainer), I’m pretty certain that I shan’t be able to join the tribe of the giant bags.